Roosevelt University officials expected enrollments to rise this year, but not at the extraordinary pace that has put the University’s fall 2008 semester on track to shatter records. There are more new students at Roosevelt this fall than at any time since the University opened its doors in 1945. In fact, the University’s new class of freshmen is up 70 percent compared to the freshman class of fall 2007. “There’s a buzz out there that is singling out Roosevelt University as the right place to be for both a quality education and a meaningful life experience,” said Chuck Middleton, president of Roosevelt University. “We’re seeing an explosion in our enrollments and a sea change in the look of our student body as a result,” he said. Roosevelt’s Office of Enrollment and Student Services is reporting that credit hours being taken by Roosevelt students are at an all-time high, as of the first day of classes on Sept. 3. With 7,654 students, the fall 2008 student body is the second largest in the history of the University. The University’s largest enrollment of 7,731 students was recorded in the fall of 1975 when the majority of the student body was made up of part-time students. Today, a little more than half of the student body is composed of full-time students. Enrollment officials also found that the average age of a Roosevelt student is continuing to drop, reflecting a further shift in the University’s enrollment from a predominantly adult population to a more traditional-aged student body. “The look and feel of the University is changing rapidly,” said Mary Hendry, vice president for enrollment and student services. “Our philosophy is ‘Students First’ and we emphasize that in everything we do,” she said. First-day enrollment figures show there are a record number of students, 728 in all, now living on campus in University housing, a 23.5 percent increase over last year. This fall, new students at Roosevelt hail from more than 40 U.S. states. Undergraduate majors with the largest enrollment increases at the University are in psychology, journalism, elementary education and English. These are normally majors pursued by traditional-aged 18 to 24-year-old students. · at the master’s level, new-student enrollments rose by 11 percent. Credit hours being taken by graduate students also are on the rise, enrollment officials at Roosevelt reported. “We are on the move and people know it,” said Hendry, who credits the University’s Strategic Plan for planting the seeds that are now bearing fruit. Adopted in 2003 under the leadership of President Chuck Middleton, the plan, above all, calls for a renewed commitment to academic excellence and the University’s historic mission of social justice. · Steven Meyers, professor of psychology, became the first Roosevelt University faculty member ever to be named Professor of the Year in Illinois in 2007 by the Carnegie Foundation for the Advancement of Teaching. · Six Roosevelt professors have received prestigious Fulbright awards since the University’s Strategic Plan was adopted, including four awards that were announced in 2008, which is the most in a single academic year for Roosevelt. · ACT scores for entering freshmen have been rising and are well above national and Illinois averages. · The Mansfield Foundation awarded Roosevelt $300,000 to bring academic excellence and social justice together through the newly expanded Mansfield Institute for Social Justice and Transformation. The institute has begun developing service-learning curricula and practical-experience opportunities for the classroom, offering all Roosevelt students, regardless of major, the chance to work with disadvantaged groups and to give back to their communities. 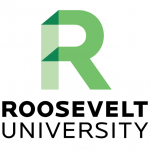 Roosevelt University, a national leader in educating socially conscious citizens, is a private, student-centered university with nearly 7,700 students studying at comprehensive campuses in the Chicago Loop and northwest suburban Schaumburg and online. Founded on the principles of inclusion and social justice, Roosevelt offers academic programs in arts and sciences, business, performing arts and education. For more information, visit www.roosevelt.edu.